Fourth grade was supposed to be a fresh start, but Mike’s already back in the principal’s office. He’s not a bad kid. He just can’t sit still. And now, his parents won’t let him play soccer anymore; instead he has to hang out with his new neighbor Nora, who is good at everything! Then, Mike and Nora discover the White Rabbit. It’s an odd shop—with a special secret inside. Its owner, Mr. Zerlin, is a magician, and, amazingly, he believes Mike could be a magician, too. Has Mike finally found something he’s good at? 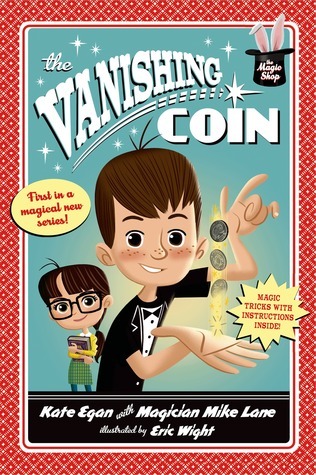 The Vanishing Coin was a cute little story about Mike. Mike is always getting in trouble. He's not a bad kid, he just can't seem to sit still. The principal, his teachers, and his parents are always telling him he needs to focus and try harder. But, fourth grade will be a new year! Until he lands himself right back in the principal's office. Now, he can't play soccer with his best friends, Charlie and Zack, anymore, and worse yet, he has to hang out with his new neighbor, Nora, who is good at absolutely everything she does! Fortunately, for Mike, he and Nora discover The White Rabbit. Is it an antiques shop? Is it a joke shop? No! Better yet, it's a magic shop! And Mr. Zerlin, the magician and owner, thinks Mike just may have what it takes to be a magician. Without giving too much away, this was a quick fun read. Mike is very likable and you instantly feel for him. Nora is nice and once Mike gives her a chance, he realizes that she's not so bad to hang around with. Jackson, the bully, keeps Mike on his toes throughout the whole story. With the help of magic, Mike might just get back on track with his schoolwork, impress his classmates, and keep Jackson from giving him too much of a hard time. Overall, this is a fun quick read for ages 7-9 filled with magic and mystery, complete with diagrams to learn the four tricks that Mike does in the story! Keep an eye out for more books in this magical new series!